Home › sinus and tooth pain › Sinus Pain Or Abscessed Tooth? Your maxillary sinuses are very close upstairs neighbors of your top teeth. In some areas, only a sliver of tissue separates the upper tooth roots from the bottom of the sinus cavity. It’s no wonder that when there is pain in that general area, the specific location can be hard to identify. Allergies, infections, and the common cold can irritate sinus tissues. When sinus tissues become inflamed and infected, it can affect the teeth. 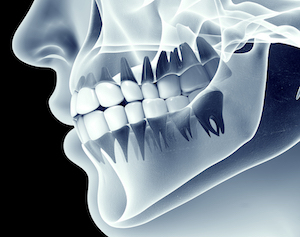 In acute cases, swollen sinus tissues can actually move the teeth slightly, changing the bite. The reverse scenario can also transpire. The infection surrounding an abscessed tooth can easily travel to the sinus cavity. An abscess is an infected pocket of pus in a tooth and/or the surrounding bone and tissue. The most common type of oral abscess initiates in the pulp of the tooth and is usually caused by dental cavities. When an abscess is small, it may go unnoticed but it will eventually bring about pain. Sinus pain usually manifests itself as a dull, continuous pain while the pain from an abscessed tooth increases in intensity. If you tap on an abscessed tooth, you will probably feel a sharp jolt of pain. You have several sinus cavities, and pain can emanate from any or all of them, so if you have infection in more than one sinus cavity, you may have pain behind the nose and eyes. As mentioned previously, it’s possible to be in a world of hurt with both troubles – an abscessed tooth and a sinus infection. Call Rotem Dental Care if you have pain in your upper jaw and lower sinus area. An abscessed tooth should never be ignored. If it’s a sinus infection, your doctor can help you. This is a situation where you need advice from both your dental and medical care provider.